North Korea is bringing back all the old Cold War fears. How did we get here? In the 1950s the struggle between Communist and American-led UN forces over the Korean Peninsula nearly set off World War III. Having come to power with a promise to “solve the problem” of North Korea, President Donald Trump is tightening UN sanctions and promising that threats from Pyongyang will be met with “fire and fury”. As in those early Cold War years, nationalistic passion, superpower prestige, and the bluff and counter bluff that is nuclear deterrence are converging in a high-stakes showdown. How did we get here again? To understand the re-emergence of this danger, it helps to step back into the history. The fact that there is a North Korea (Democratic People’s Republic of Korea, or DPRK) and a South Korea (Republic of Korea, or ROK), is a legacy not of the Cold War, but of World War II. The whole peninsula had been under the control of Imperial Japan, whose surrender in 1945 left the country divided (similar to Germany) between the victorious allies: the USSR in the north and the United States in the south. Unlike Germany, the equilibrium did not remain peaceful for long. As communist forces fought on to victory in China, the great power alliance of 1945 broke down into the ideological enmity of the Cold War, and the rivalry of the two Korean governments was re-contextualized by the new superpower competition. When the Koreas went to war in 1950, the American-led UN forces supporting the South faced Soviet pilots in the air and the “red wave” of Chinese troops on the ground. Right up to the moment when the fighting ceased, President Dwight Eisenhower’s national security council was considering using the atomic bomb, but hesitated out of concern that it could broaden the conflict with the USSR (by then also a nuclear power) into Europe. The Americans agreed to extend their Asian alliance system to the ROK and has stationed a large military force in the South since then. Despite some tensions (such as when the US and ROK forces conduct combined exercises), the armistice broadly stabilized the situation for the next 40 years. Why – just when the rest of the world was breathing a sigh of relief that the risk of global Armageddon had receded - did the DPRK set out on the dangerous and difficult journey to becoming a nuclear weapons power? With the end of the Soviet Union in 1991, the regime in Pyongyang lost its main economic ally. In the same year the Gulf war showed how stealth technology and precision weapons applied in a network concept of war were able to overwhelm Saddam Hussein’s large army (irrespective of the deterrent power of its feared chemical weapons) in only 100 hours. Then in 1992, China, treaty bound since 1961 to defend the DPRK, extended diplomatic recognition to its rival, the ROK. Long before the 1990s, the DPRK had been developing a reputation as a “rogue state”, through acts such as its kidnapping of foreign nationals (infamously but not only from Japan) since the 1970s. But as the nuclear programme progressed, such incidents became increasingly violent and bold. In 2010 Seoul accused the DPRK navy of sinking one of their ships, the Cheonan. Later the same year, the DPRK lobbed scores of shells at Yeonpyeong island, killing a ROK serviceman and wounding others. Missile tests frequently result in weapons landing in the open ocean or – as happened last month – inside the “exclusive economic zone” of sea less than 200 nautical miles from Japan. The Malaysian Prime Minister recently accused the DPRK of being responsible for the assassination in Kuala Lumpur Airport of Kim Jong Nam, half-brother of ruling Kim Jong-Un, using a chemical agent. A defiant approach has yielded diplomatic results for the DPRK leadership. During the 1990s it gained sanctions relief from the Clinton administration in return for concessions on its nuclear programme. Initially the George W Bush administration added North Korea to its Axis of Evil list, but towards the end of the second term, DPRK funds were unfrozen and the country was removed from the US list of state sponsors of terror. Given the success of this approach, it is neither surprising nor irrational for North Korea to continue to boldly go its own way, so long as the benefits continue to outweigh the cost. 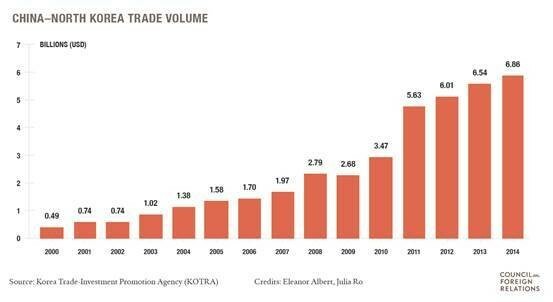 Despite UN sanctions designed to put pressure on the North, trade with neighbour China has continued to grow. While North Korea made steady progress with its nuclear programme, evading sanctions and lashing out periodically, something else was happening that would re-contextualize the Korean situation: the rise of China. When Washington looked up from the aftermath of the 9/11 wars in the Middle East, a fear took hold that its dominance of the security system in East Asia seemed to be slipping away. The initial reaction came in the form of President Barack Obama’s “pivot” to Asia. China`s rise interacted with another side effect that Pyongyang’s behaviour was having in the region. As observers in Japan watched Chinese power grow, many felt their American allies might become less ready to back them in the event that tensions with Beijing escalated into a fight. The spectacular belligerence of North Korea provides a compelling narrative about a threat to Japan. This serves two functions from the point of view of those who wish strengthen Japan`s military and increase its strategic autonomy. First, it helps to mute the opposition the Japanese population feel towards having a bigger military (a legacy of ruinous militarism in the early 20th century). Second, it means that if Japan wanted to invest in stronger military capability to deter China, it could, while ostensibly defending itself against North Korea. Without the Korea threat, Japan would appear to be preparing for war with China, which would provoke domestic opposition, as well as serious economic if not strategic consequences from China. The DPRK’s progress developing ballistic missiles with ever greater range are also having a significant effect on the ROK’s position. This is with regard to its US ally on the one hand, and its main economic partner China on the other. The doubt that arose in the “pivot” era about the reliability of the US as an ally, and the irresistible attractions of the Chinese market, caused speculation that the ROK might lean towards China. Perhaps one day it might ask the US forces to leave. However, the DPRK’s progress towards a long-range missile capable of carrying a nuclear warhead may have scotched this trend. This is because anti-missile technology requires the positioning of radars in a network formation to effectively track threats and guide anti-missile missiles on to their target while they are in the air. Such a missile defence system has been rolled out within the framework of the US alliance structure, reinforcing interdependence and binding Japan and the ROK closer to Washington. The fact that this radar network is capable of looking deeply into Chinese airspace is obviously a negative for Beijing. All this poses a dilemma for China. On the one hand, allowing Pyongyang to continue on this course spoils China`s relations with the ROK, hardens the US alliance structure in the region, and encourages Japan to develop military capabilities that make it a potential rival. Ultimately, if the US is determined that the threat should be addressed with a tighter economic blockade, a cyber or conventional military strike on the North, this could precipitate a war with huge fallout (humanitarian as well as nuclear) affecting China. North Korean Vice-Foreign Minister Han Song-Ryol recently told the BBC in April that North Korea will react with a nuclear pre-emptive strike if America is even “planning” a military attack. Defending its ally would tip China into war with America, but being seen as failing to do so would be humiliating. On the other hand, if China puts pressure on North Korea, it risks collapsing the regime, which would open a Pandora’s box of security challenges. Ever since the Chinese Communist Party has been in power, the DPRK has been a buffer between China and the US troops stationed in the South. But might a unified democratic Korea opt to maintain its alliance with the US? In an era of growing Sino-US rivalry, would the Americans pack up and go home, or would they prefer keep their radar network, etc, at the border? Would a unified Korea give up the nuclear weapons it inherited from the DPRK, or re-target them? Is this the next tipping point? Soon after becoming president, Donald Trump connected the Korea security issue to the trouble he perceived in US-China economic relations. This led some to speculate that he saw the Korea issue more as a lever for economic policy than a genuine national security threat. The creation of issues that can later be traded for advantage is said to be part of the “art of the deal”, after all. The potential for misunderstanding and miscalculation that always exists in world politics is therefore increased by the interdependence of US and China as partners and rivals, and by the ambiguity of means and ends in different aspects of their relationship. Both Trump and China’s President Xi Jinping have an interest in signalling strength and not being seen to back down or come out worse in any sort of trade-off. Since the Trump administration declared the policy of strategic patience to be over and vowed to “solve the problem” of North Korea, the diplomatic, military and rhetorical pressure has been mounting. Following the latest UN Security Council Resolutions imposing unprecedented sanctions, a DPRK military statement was issued describing plans to launch a strike around the US territory of Guam as a “warning signal” to America. As military preparations intensify and the rhetoric heats up, the risk of triggering a hugely costly war by mistake is increasing.